Anyone with a Facebook, Twitter, or Tumblr account has probably noticed a growing trend in the behavior of many web users. If certain people have a question, any question at all, they are increasingly likely to post their question to a public place, no matter how easily the answer might be found with Google. I’m not sure if this behavior has an official name, but I call it “Asking the Aether”. 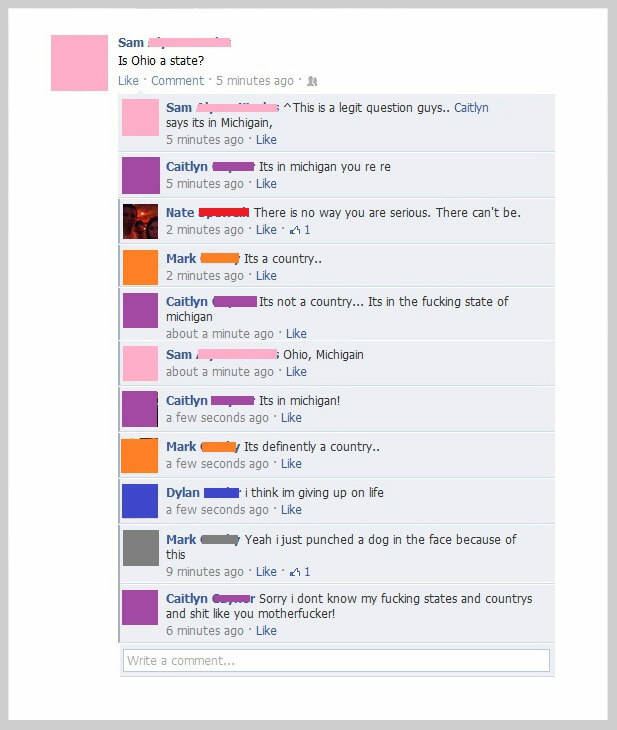 I’m still hoping the first example is a fake screenshot, but regardless, I have no doubt that many similar conversations appear all over Facebook every day. 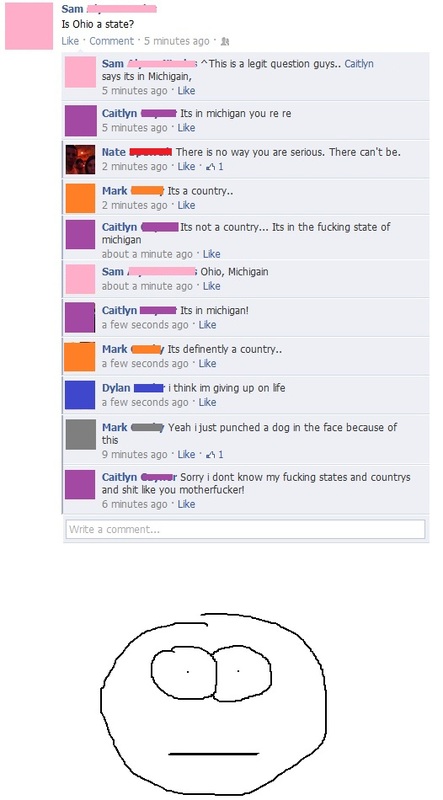 It’s particularly surprising to see how upset the person gets once they realize that Ohio, is in fact, a state. Certainly they knew this information was at their fingertips? It’s just a Google search away? But they decided to ask Facebook instead. Were they unable to predict this reaction from their peers? For me, the Tumblr post is much more interesting. OMG Where Can I Get That? Due to the popularity of “reblogging”, content on Tumblr is easily divorced from the original source. Images get reblogged and reuploaded, destination URLs get changed, sometimes the source button takes you to the original, but often times it does not. One day recently, I guessed that these types of posts represented an opportunity. I don’t mind saying that I pride myself on my Google skills. With the right keyword choice and tools like reverse image search, I was sure I could find these items for sale. I signed up with a few affiliate programs, I bought a domain (findthatthere.com) and I registered accounts named findthatthere on the biggest social sites: Reddit, Twitter, and most importantly, Tumblr. 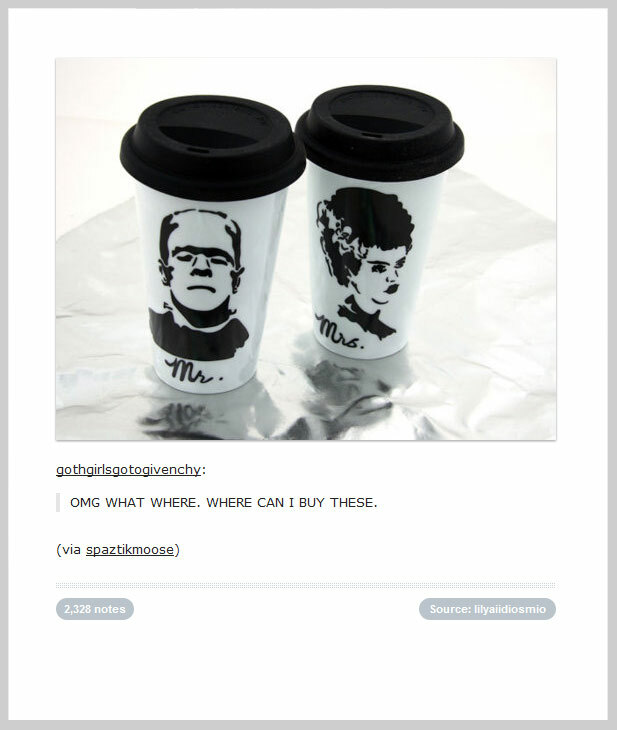 “Where can i buy” alone results in a total of 3 million hits (as of March 2012). If you narrow your search by “past 24 hours”, you’ll see that roughly 100 people post this comment to Tumblr every day. 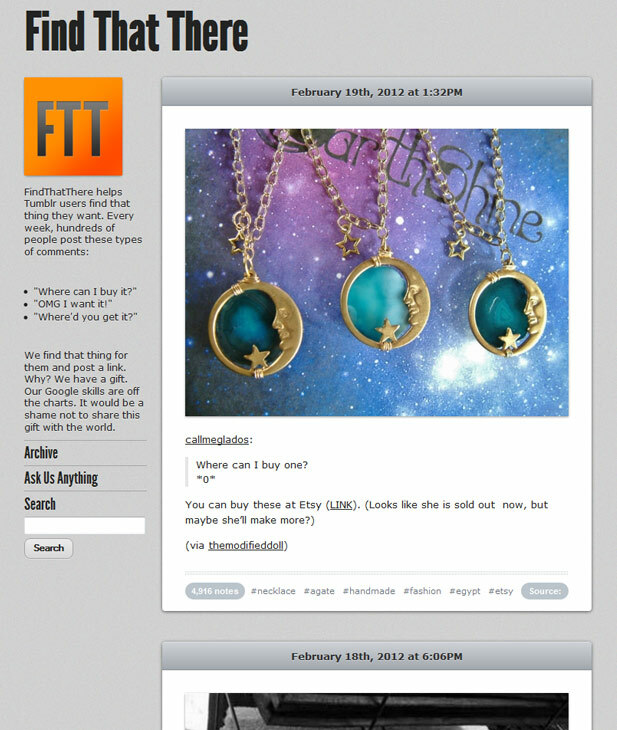 My next step was to reblog each post and add a link to the place where that item could be found. Alas, FindThatThere was not successful. Unfortunately, there is no sure way to get your reblogged post in front of the right person. Tumblr only alerts you by email if another user follows you or asks you a question. A user would only notice my reblog if they were paying close attention to their blog’s activity feed. I could send them a message using the “Ask” feature, but Tumblr does not allow links to be included in messages. FindThatThere is no longer active, but I still think there is money to be made. Tumblr, the company, should embrace this trend in behavior. The easiest way would be to hire one person to monitor all new comments that include “where can i buy”, then message each commenter with an affiliate link. 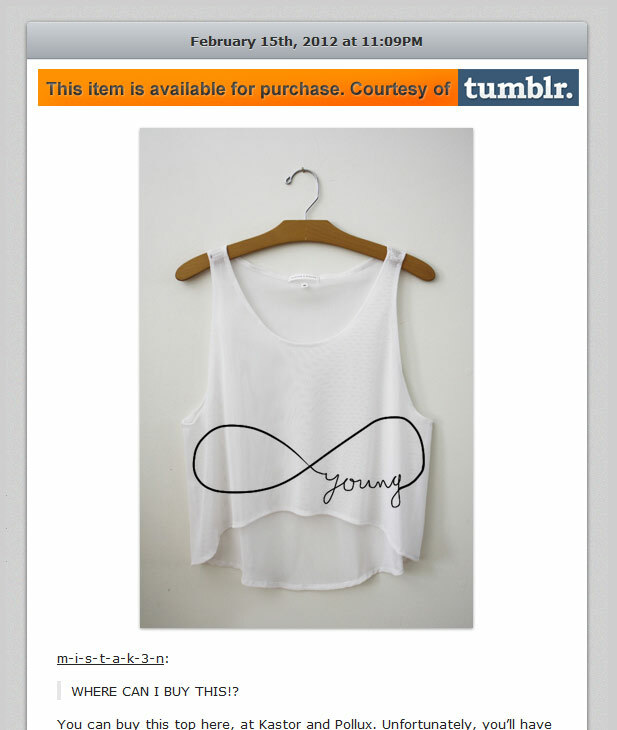 That commenter was certainly not the only Tumblr user to see this post and wonder where they could buy it. A bright orange badge would alert all other users of the affiliate link as well. Now both of these initiatives might only bring in a few measly dollars, but imagine what would happen if Tumblr users started to expect this kind of functionality. Searching on Google can be difficult and frustrating for many people. What if Asking the Aether becomes the new normal? What if every time they want to buy something, they just post a comment? 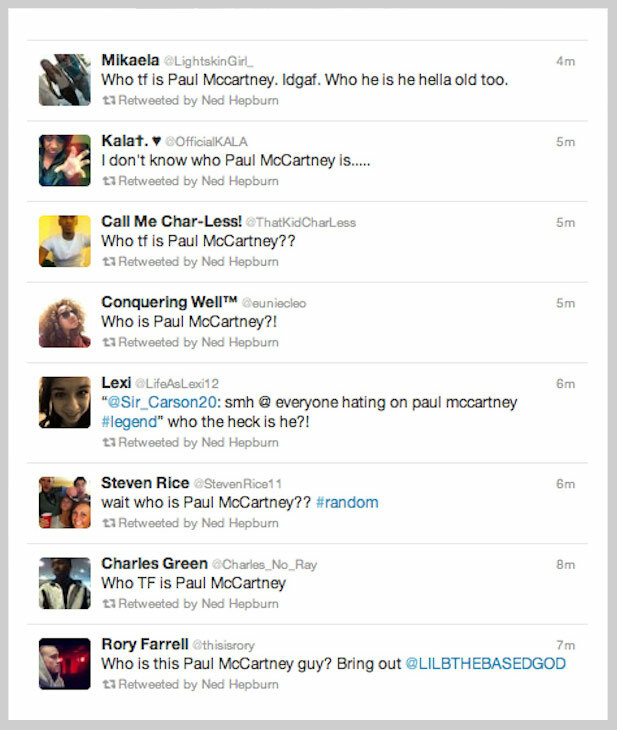 If that happened, Tumblr would begin to replace Google for those users. And that would be worth more than dozens of dollars.